12 :: Gerrards Cross Golf Club is considered one of the most attractive courses in South Buckinghamshire. 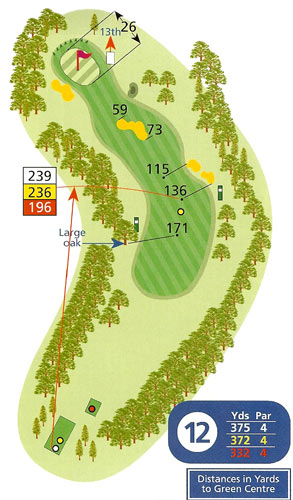 This sharp dog-leg to the left tempts players to carry the high trees which can reduce the second shot to a wedge if successful. The penalty for failure, however, will almost certainly be a bogey or worse. A recently added bunker on the right of the fairway means that the line from the tee has to be well left if it is to be avoided. The safe line avoiding the trees can leave a long second shot into the raised green which is guarded by a bunker on the left. If missed right or long, getting up and down in two shots will require a delicate chip.